Christian Art uses signs and symbols to teach and represent the fundamental religious truths of Christianity. Christian artists used symbols to make the spiritual nature of their work more easy to grasp. The nimbus, or halo, seen in Heinrich Hoffman's Christ in the Garden of Gethsemane is a luminous cloud of light seen around the heads of saints and angels which symbolizes the beauty of Holiness. 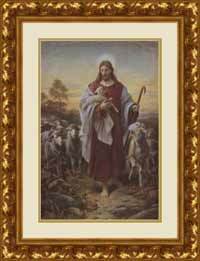 The Good Shepherd is probably the earliest of all Christian symbols and represents Jesus Christ. Christ is often seen with a sheep in his arms. The Lamb is a similar symbol, in that it represents Jesus as the Lamb of God, the sacrifice of whom taketh away the sins of the world. There is also a recurring theme in Christian art of the lost sheep returning to the fold. This is a reference to the tendency of humankind to stray from the path of righteousness. It is the ever-vigilant kindess of the shepherd that brings us back to the flock. In Christian Art, flowers are also used as symbols, the lily signifies purity and is often seen with the Virgin Mary or with the angel of the Annunciation. Pomegranate symbolizes immortality and the rose symbolizes love. The dove symbolizes the Holy Ghost. 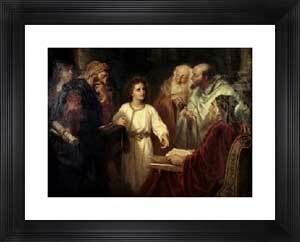 Click here to see Christian Art. Click here to see Jesus Art. Click here to see Madonna Art. 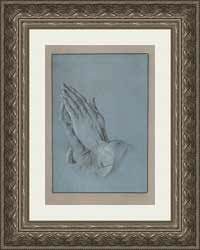 Search for framed art prints by your favorite artist, title or subject. Great prices. 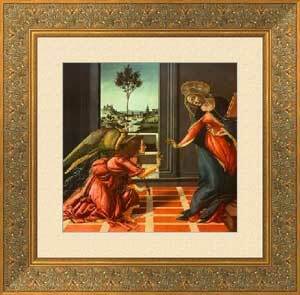 Save up to 50% or more off frame shop prices everyday. Highest-quality frame materials and construction. Easy site. Choose your print and frame, or buy an art print with a mat and frame that we suggest. Site design, text and images © Copyright 2003 - 2009 Goldensight, Inc. All rights reserved.